When the sun is shining and warm weather is all around, women's tall shorts are a basic necessity. Everyone knows the summertime staple is tank tops, shorts, and flip flops. So, you'll definitely need several pairs of shorts to get you through the heat. Some of the tall options you will come across are women's bermuda shorts, denim shorts, khaki shorts, and cargo shorts. They are, also, available in a variety of long inseams, from 5" shorts to 10" shorts to 12" bermudas. 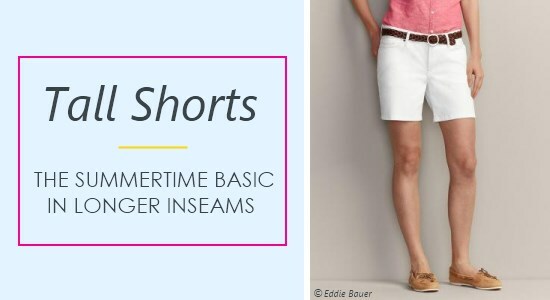 While only a few of the stores below carry ladies long shorts in actual tall sizes, all of them offer shorts in longer inseams, giving tall women extra coverage. Of course, the great thing about being blessed with long legs is that you really get to show them off when wearing shorts. Isn't being tall wonderful? Aeropostale - $ | Casual apparel targeting the younger crowd. Long size jeans and pants in 34" inseams. Also has bermuda shorts and longer length tops. Shop online or at retail locations. Athleta - $$ | Athletic clothing for the active woman. Activewear pants in up to 35" inseams as well as ladies tall shorts, casual dresses and skirts, workout tops and tanks, and long torso swimsuits. See the special Tall Sizes section in each category. Banana Republic - $$ | Fashionable, contemporary businesswear and apparel. Wide variety of long size jeans and pants in 36" inseams. Also offers women's tall shorts, skirts, dresses, tops, sweaters, suits, and professional jackets. Select the Women's Tall category to view all tall clothing. Shop online or at retail locations. Buckle - $$ | Casual apparel targeting the younger crowd. Large selection of mid-priced and designer jeans and pants in up to 37" inseams. Also has knee shorts and bermuda shorts as well as longer length tops. Shop online or at retail locations. Cabela's - $ | Casual, outdoor clothing. Long size jeans in 34" and 36" inseams. Select denim in up to 38" inseams. Also find long length women's bermuda shorts and hiking shorts. Extended sizes available. Shop online or at retail locations. Eddie Bauer - $$ | Casual and outdoor styles as well as professional businesswear. Most of the entire women's collection including jeans, pants, tops, dress shirts, sweaters, dresses, skirts, long shorts, suits, outerwear, sleepwear, and swimwear are available in tall. Ladies pants and denim have a 36" inseam. Plus sizes available. Shop online or at retail locations. Gap - $$ | Fashionable, trendy apparel. Variety of long size jeans and pants in up to 37" inseams with select styles in 38" inseams. Also offers tall shorts (khaki and denim shorts), skirts, dresses, tops, sweaters, coats, jackets, and maternity in tall sizes. Select the Women's Tall option to view all tall clothing. Shop online or at retail locations. J.Crew - $$ | Fashionable, contemporary apparel. Jeans and pants in 36" inseams with a select few in 35" inseams. Also offers tops, jackets, suits, sleepwear, and swimwear in tall ladies sizes. Shorts are not tall size but do come in longer lengths, from 5" shorts to 9" shorts. Shop online or at retail locations. L.L.Bean - $ | Casual, relaxed clothing. Jeans and pants in tall sizes for women 5'9" and over (according to the size chart). Also sells long torso swimsuits and long shorts, including women's bermuda shorts and chino shorts. Extended sizes available. Shop online or at retail locations. Land's End - $ | Classic, casual style. Jeans and pants in up to 36" inseams. Free cuffing and hemming available on select items. Also offers tall tops and swimwear. Ladies shorts are not tall size but do come in longer knee-length and bermuda styles. Extended sizes available. Also in the U.K.
Next - $ | Tall size jeans, pants, and trousers in 35" inseams. Also carries tall shorts, rompers, tops, sweaters, dresses, skirts, jackets, businesswear, activewear, and sleepwear. Select Tall under the Women's section. Based in the U.K.
Old Navy - $ | Casual apparel targeting the younger crowd. Jeans and pants in long (34" inseam) and tall (36" inseam). Also has inexpensive tall shorts, skirts, dresses, tops, jackets, activewear, and maternity. Extended sizes available. Shop online or at retail locations. Talbots - $$ | Sophisticated, classic style. Long jeans and pants in 35" inseams. Also offers longer 5" shorts to 13" shorts. Extended sizes available. Top Shop - $$ | Trendy collections. Long length jeans in 36" inseams. Trousers and leggings in 35" inseams. Also carries women's tall clothing such as shorts, skirts, dresses, tops, and jackets. Shop online or at retail locations. Based in the U.K.